NOAA ship Oscar Elton Sette, known as Sette, is a large ship, by my standards. It’s 224 feet long, which is more than ⅔ of the length of a football field. 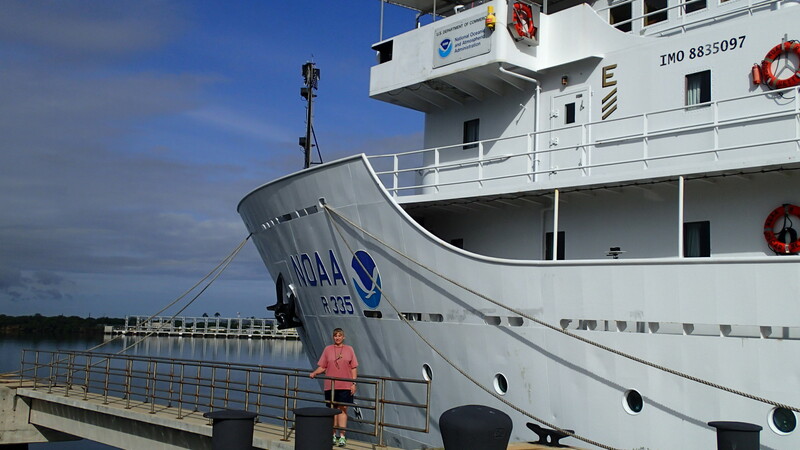 It is one of the ships in NOAA’s fleet of oceanographic vessels and like their other vessels, it supports NOAA’s mission to protect and manage the use of ocean resources through ecosystem-based management. On this cruise, we will be surveying fish populations by deploying a Remotely Operated Vehicle (ROV) and an Autonomous Underwater Vehicle (AUV) to gather information. The ROV is a small, unmanned submersible that is controlled from the Sette and attached by a cable. The AUV is also an unmanned submersible but its path is pre-programmed before it is deployed. Additionally, we will be using acoustics, or sound, to locate, identify, and estimate populations of fish. I met some of the scientists last night who are working with the submersibles and the acoustics. I think this might be one of those times that being good at video games could pay off! The goal of the Hawaii Bottomfish Survey is to gain more information about the fish populations in the ocean around Hawaii. The survey will help scientists determine the effects of fishing and other factors on the overall health of different fish populations. By gathering information by non-lethal methods NOAA scientists are adding to their knowledge base without further reducing the fish population. Yesterday, I met the Chief Scientist, Donald Kobayashi, PhD, for the first time. Dr. Kobayashi is the man in charge of the scientific portion of our Hawaii Bottomfish Survey aboard the Sette. Dr. Kobayashi took me to Ford Island so I could board the Sette prior to today’s workday getting ready for the survey. I boarded the Sette and met the boatswain (pronounced bosun) and some of the science party. I also moved into my berth, or stateroom. It’s called the bunkhouse and has six bunks in it. I’ll be sharing it with four other scientists while we are out to sea. It’s important to be able to get along with other people and to be flexible when you are on a ship, just like it is in other situations. But on a ship, where you are in a confined space, it’s even more important to understand the hierarchy of the ship–the officers, the crew, and the science party–and the protocol (the proper way of doing things) so you don’t get in someone’s way or make someone’s job more difficult. Knowing who is in charge, what the roles are, and the expectations for everyone will help make my adventure a success. The scientists can tell what type of fish they are tracking and how many of them there are by using sound waves? The scientist sends out a sound signal, or ping, from a transducer, an underwater device that emits sound waves. The Sette has several transducers to accomplish this. The density of the fish’s swim bladder is different than the rest of the fish so the sound, or echo, that bounces back from the fish to the ship can be recorded and interpreted by the scientists. They can tell what type of fish they are tracking, and how many of them there are. Dr. Kobayashi says the scientists can back up their interpretation by photography. This entry was posted in 2013, NOAA Fisheries Service, NOAA Teacher at Sea, Rita Salisbury and tagged AUV, Bottomfish, Oscar Elton Sette, ROV, Sette. Bookmark the permalink.